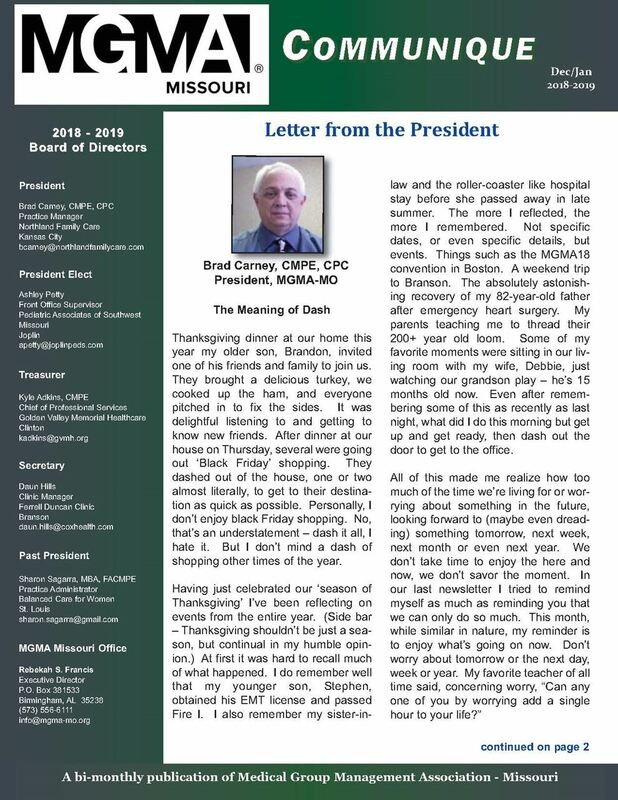 MGMA-Missouri’s newsletter Communique’ is published six times a year and is emailed to our entire membership roster. We also use this publication to send to administrators across the state interested in membership. All newsletters are archived on our website for members or outside parties to access. *A discount of 10% off total with placement of four or more ads. The MGMA-Missouri website, mgma-mo.org, is our face on the web. Our website houses tools and information, association news, on-line membership application, conference information and pictures, sponsor listings, a job board and a Members Only area that includes a membership directory, and a variety of other resources for our members and website visitors. Your logo appears on our home page and includes a link that will take visitors and members directly to your company website. Website Sponsorship Listing Includes: Company Logo, Description of Product/Service, Contact Name, Address, Phone Number, and Contact Email. This cost is $750 per year.